Rick Polad explains the details of the new seismograph in Stephens Hall to an Aurora University student. 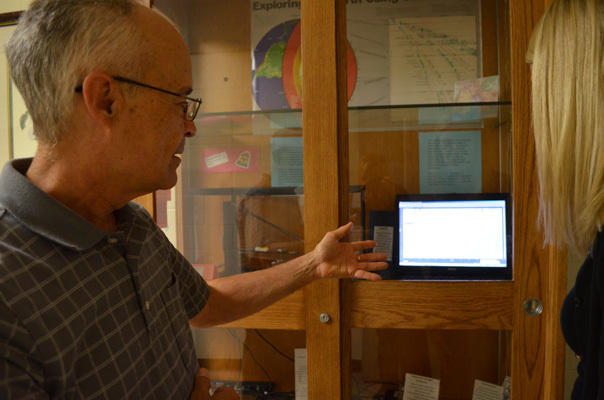 Rick Polad, Pro-Rata Instructor of Physical Sciences, submitted the AU proposal at a time when the IRIS was looking to add seismometers, a detecting device equipped to measure the actual movement of the ground, in the Northern Illinois area. “This is a wonderful opportunity for the university because this is a national project which adds to the AU scientific footprint as we join schools across the nation and collaborate with them to gather and assess data,” said Polad. The Northern Illinois area has previously received little attention due to the relative lack of seismic activity; however recent activity has shown this area to be more complicated than originally thought. While the area is still relatively inactive and will never suffer a major earthquake, every small earthquake in the last few years has identified a new fault zone. The seismometer will record any earthquake over a 3.5 magnitude within a radius of approximately 93 miles from AU and all earthquakes over a 6.5 magnitude anywhere in the world. The seismograph can be viewed on the first floor of Stephens Hall. The IRIS website also provides a real-time image of the seismograph with a 10-minute delay for uploading the data. The screen shows 24 hours of data with hours on the Y axis and minutes on the X axis. The newest data is on the bottom line which scrolls to the right.